Golf games are a dime in a dozen, so is there anything about Battle Golf that makes it stand out? Well unlike real golf, this title from Colin Lane is simple, easy to pick up yet offers an engaging gameplay. And while golf is usually a calm, soothing game, this one has a more frenetic pace and some really unusual settings. When you play in single-player mode, your goal is to make as many holes in one shot as possible in sixty seconds. This isn’t your typical golf course however as you need to make those shots near the water and under different situations. The holes rise up from the water, ready to take you on. Many of these holes have banked edges, but others are flat, making it more challenging to hit the shot. Nevertheless, you’re not helpless since the game controls are easy to learn. Tap once to turn off oscillation aim and tap again to stop a power meter. Now you just swing and try to get that ball in the hole. There is also an option for two players to battle in a race to five. While the game takes inspiration from the real game, its humorous nature and gameplay makes it more casual and suited for those who just want to have some fun. 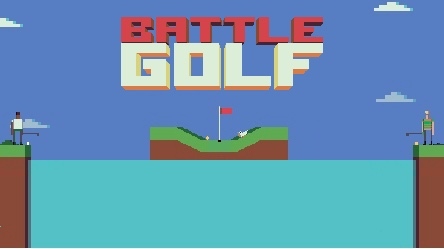 Battle Golf makes golf accessible for the casual gamer. It is silly, colorful, addictive and very easy to pick up. Whether you play golf or not, you’re going to want to play a few rounds here.